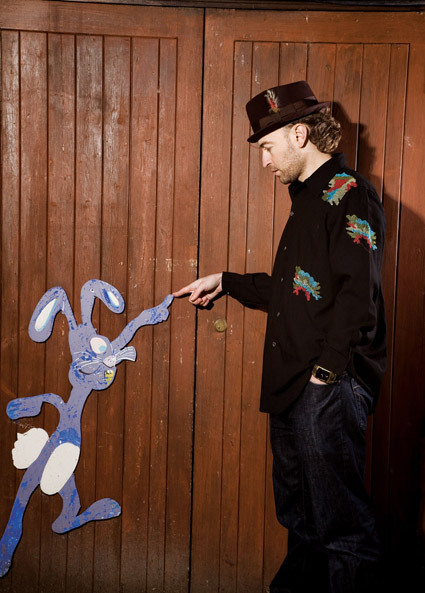 Chris Manak, aka Peanut Butter Wolf has been active as a producer since 1989. In 1996 he formed Stones Throw Records. Since 1999 he has nearly given up producing. Now he enters Europe with his new video DJ show. Within the framework of the Stones Throw Europe Tour he will present his multi stimulating Serato Video SL Show for the first time all over Europe. With a full visual firework the legendary producer and DJ complements his airtight sound mixing while using old videos and scratching them through beats and breaks. To get some background information Carhartt Music asked him some questions about his show, his label and his career as a producer. Stones Throw is one of the most unpredicable hip hop record companies in the world – what is the secret behind your business? Peanut Butter Wolf: My secret is that I went to college for business, but didn’t apply anything I learned there to my company. It’s funny that we will always be labeled a hip hop company because that’s what the first records we released were (although Funkaho came out about 10 years ago). When I first started buying records in the late 70’s/early 80’s, I was buying rap, soul, funk, disco, new wave, post punk, and electro. Over time, I’ve been more comfortable exposing the Stones Throw audience to these different types of music. There’s been a lot of debate by the fans, but that’s what keeps me from getting bored after doing it for so long. In the last month you released music from artists like Mayer Hawthorne or Omar Rodriquez Lopez that go far behind Hip Hop – how will Stones Throw sound in the future? Peanut Butter Wolf: Hopefully, I will be releasing a type of music that hasn’t been invented yet, although, without sounding like the old guy, Kraftwerk did things 30 years ago that still sound more revolutionary now than a lot guys, so it’s not so important to me to try to put out the latest flavor of the month. With your labels Now Again and Soul-Cal you take a close look on long forgotton soul and funk gems – all for the love of music or also with a little educational aspect to show how rich and ramified the American music history is? Peanut Butter Wolf: Those are more or less the labels of my partner Egon so i can’t say much about it, but thanks for the props. Your new performing program includes Serato Video SL – what can we expect from this and what exactly happens when you dj with videos? Peanut Butter Wolf: What happens is half the crowd dances, half the crowd watches, and if I do the right thing, most of the crowd smiles. How do you select the visuals for this? Only music videos or also movies? Peanut Butter Wolf: Mostly music videos and TV performances, but I do throw in movie scenes and “you-tube” type skits here and there. How do you dj to pictures – are there two different line outs or is it all connected? Peanut Butter Wolf: It’s all connected, but the audio comes from the mixer and the video directly from my computer. A lot of people have reservations against digital djs because they say that you never know if it is the machine or the dj who is mixing! How do you see this problem? Peanut Butter Wolf: I think it gives people something new to get on message boards about. When Serato first came out, I was against it. I still love spinning with wax, but for different reasons that take too long to explain. You did’nt release music by your own for a long time – can we expect something new soon? Peanut Butter Wolf: I release things here and there, but not a full length where I did all the music in over 10 years. I just bought some drum machines and a synth and a 4-track and have been recording. If I feel like what I do is good enough to share, then I’ll release it. I enjoy doing remixes so I’m doing more of that too. From the outside it looks like Stones Throw is not a record company but rather a big family of crazy dudes that are addicted to music – how does it come to this picture? Peanut Butter Wolf: That’s what it is on the inside too. We’re all collector nerds and that probably even more than what the stuff we make, is what bonds us. We all fight over the same stuff in the used vinyl stores when we tour. Good music is good music.